So I noticed this new forum for Kirbites to populate being talked about on KRR. I go by the username Fubaka in most places. 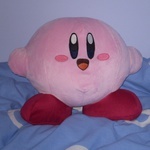 My primary dedication is to editing WiKirby, but I also serve as administrator for another Kirby forum called Meta Naito. You can find it here: metanaito.net/forums/index.php (the rules are similar to this forum). I hope we can form a mutual relationship between the two forums. Welcome! I hope we can bring the Kirby community closer together! Thanks for having me, Meggolor. I'll be sure to make posts in both of these forums whenever I have something new to share with you all. I am presently on the lookout for any new info regarding the upcoming title, Kirby's Blowout Blast. As of now, there is still only a brief blurb of a page about it on Nintendo's site in the West, and no dedicated page yet in Japan. (which I find odd). Welcome to Another Dimension, Fubaka!